Ratcliffe’s writing on Shakespeare in Tyuonyi is roughly coeval with the sustained meditations on sound-shape and sonic visuality in Listening to Reading in which he invokes an oft-cited Wittgensteinian text: “Do not forget that a poem, even though it is composed in the language of information, is not in the language-game of giving information.” In Listening to Reading, Ratcliffe reminds us that language is only what it says by virtue of what it does — meaning made tangible (however temporarily) by the confluence of acoustic, visual, and intellective interplay; which is to say that the best writing doesn’t shrink from blatant, shrill, conspicuous meaning-making but rather asserts itself as crafted, material object next to what it says. This is precisely the manner by which Louis Zukofsky made Shakespeare his contemporary: in his massive critical statement Bottom: On Shakespeare, Zukofsky reminds us that Shakespeare’s characters are both actors and words on the page, words that can outperform their speaking counterparts even in what they don’t say. 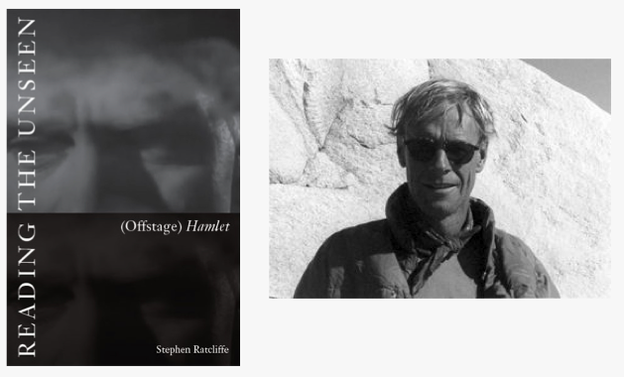 Ratcliffe’s Reading the Unseen: (Offstage) Hamlet (Counterpath Press, 2010) also begins with the mystery of Shakespeare’s characters, but where Zukofsky’s language “sees,” Ratcliffe’s is unseen — felt somatically (often deeply) through the interplay of senses. The book’s claims are humble and in some ways totally conspicuous, but its conclusions are much larger than they purport to be. Here’s the thesis: while we’re not always cognizant of the fact in the theater, the majority of “action” in Hamlet happens offstage, in and as language, through dialogue, anecdote, and aside; in fact, virtually all of the major plot-advancing action takes place through description, in the character’s speeches about absent actions: King Hamlet’s murder, Ophelia’s death, Hamlet’s voyage to England, et cetera. Which is to say that when we watch Hamlet, we find ourselves watching speech (or better, watching our minds seeing what they’re told to see). As such, Ratcliffe concludes that Hamlet performs, sometimes blatantly, how words can be entirely present while absconding their own materiality in the totally absent center of meaning-making. As such, “‘Words, words, words’ (2.2.192) in these speeches make physically absent things imaginatively ‘present’ … they ‘show’ us action we don’t actually see; how what is concealed from us (thus unseen, unknown) is essential both to [Hamlet] and to our lives in this world …” (xi–xii). Which is to say, finally, that words “see” what is unseen; they paint for us absent action and bring to life (imaginatively) language in our heads while somehow retreating into their own materiality (or lack thereof). So, for Ratcliffe, “words … are what Hamlet itself is ultimately about” (52). It’s a brilliant thesis, hard won by Ratcliffe’s particular brand of obsessive close reading, but what makes it truly masterful is how it too, layer upon layer upon layer, rehearses how language actually works. While the book is ostensibly about offstage action (just as language has a determinate content), “there is more to it than meets the eye, and ear too for that matter” (30). While this book is certainly about Shakespeare, it is also just as much not about Shakespeare (in a prototypical avant-garde tradition); let’s say, for argument’s sake, that Reading the Unseen is an allegory for poetry, which makes Ratcliffe’s project, like Shakespeare’s before it, a book about words. Poetry is all about reading the unseen, making aurally-visible and visually-aural what is ostensibly not there — that poetry (and here Ratcliffe is actually talking about King Hamlet’s ghost) “may be taken to represent (“perform,” literally to embody) everything we cannot see (and thereby know) in this world” (3). Or better: poetry creates “a world made of words in which the eye sees only what the ear hears, thus sounding the limits of perception itself” (32). By staring squarely into the darkness of Ratcliffe’s text, we find what is most contemporary about its claims: that that which is most obscured by language is language itself. Which is, of course, precisely the kind of all-too-obvious-and-thus-totally-brilliant thesis Ratcliffe makes about Shakespeare. But let’s abstract a bit further. I’d argue that Reading the Unseen joins the classics in the genre (say, Zukofsky’s Shakespeare, Olson’s Melville, and Duncan’s H.D.) in that every word applies too, and perhaps with greater precision, to his own work, making Reading the Unseen an occulted statement of poetics. Ratcliffe’s poetry practice is also about what goes unseen in “words, words, words,” in that much of what shows on the page is determined by so many exacting procedures unnoted in the text. For example, when I first met Ratcliffe his line lengths were often determined by the shape of the right-hand margin alone: using a stock version of Courier (because, according to Ratcliffe, the letter width is exactly the same for each character, including spaces), he’d slowly shape a wave in the margin until he was satisfied with its visual semblance. The problem, of course, is that such formalism is a bit Sisyphean, especially if the printer cannot exactly duplicate the margin in print. His work is often determined by these unseen constructs whether they register to the reader or not; for example, in Portraits & Repetition, Ratcliffe set himself a number of formal compositional constraints that, while absolutely crucial to what we see on the page, barely register to most readers: the book is 474 pages long (an arbitrary but exacting number as a handful of Ratcliffe’s books share a similar page length), five couplets a page, with line lengths determined solely by characters per line (sixty in the first line, fifty-seven in the second). At the end of the day, these formal restrictions (or permissions?) 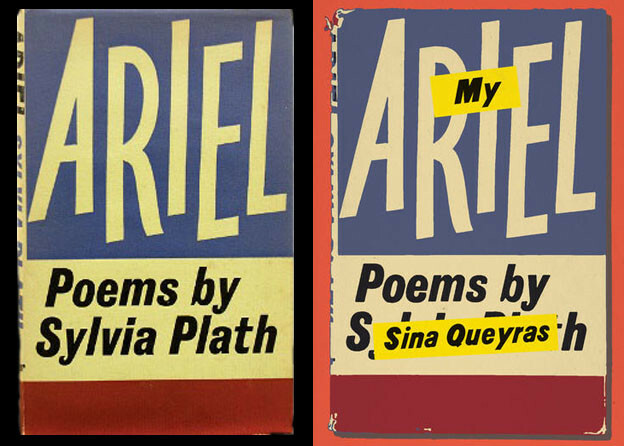 often mean very little to the reader of the poem, but they absolutely and irrevocably alter how the poems appear on the page. Ratcliffe wants to remind us that it is precisely the unseen labor of composition that most often disappears in the glossy reified book product as it’s prepared for publication, and in some ways his Reading the Unseen takes us back to the factory floor to underscore the poem’s status as made thing, clearly articulating the variety of unseen actions determining its hidden raison d’être.